It might have been a shade better than had been expected, but Australian 4Q18 inflation is still heading further away from the RBA's target midpoint, not closer to it. 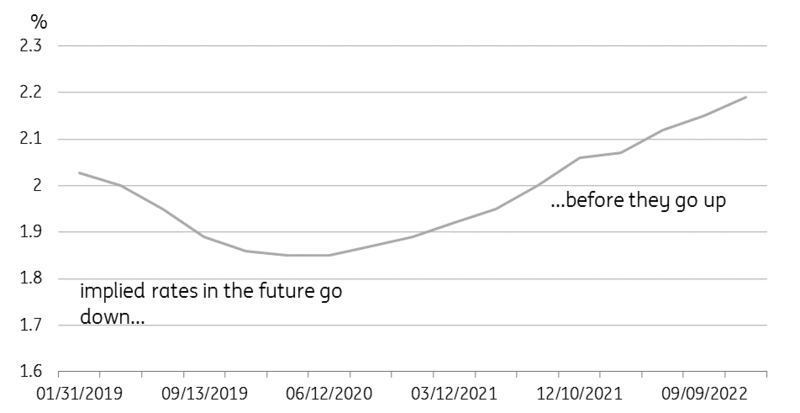 Australian bank bill futures are hard to read right now, given the funding pressure on banks has pushed up spreads over the RBA's cash rate, but from today's spot of about 2.03%, they decline to 1.82% by March 2020. This may signify no more than a calming down of funding pressures in the medium term and narrowing of the bank bill - cash rate spread, but it could also suggest that markets see the chances of a rate cut outweighing those of a hike. In our view, neither is probable near term. 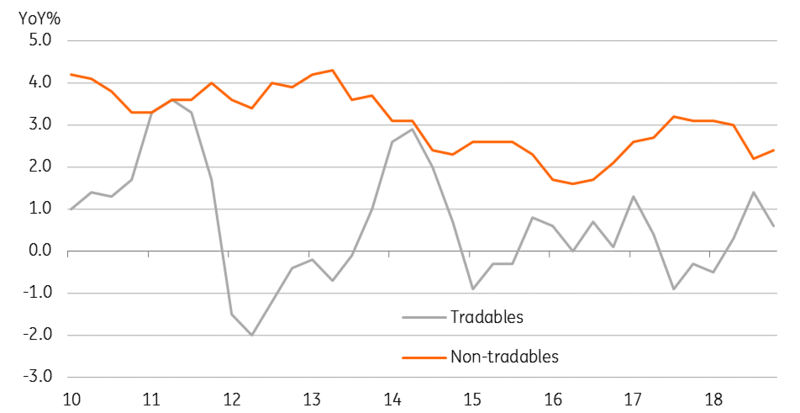 In what was a release short on interest, our eye is drawn to the split of tradables vs non-tradables (tradables are things like books, cheese, machinery, which can be obtained locally or by importing, whilst non-tradables are things like utilities, restaurant meals). This split shows tradable goods prices falling 0.3% QoQ, while non-tradables prices rose by 0.9%QoQ, returning to rates of growth seen during the second half of 2017 and early 2018. While this might be expected to be reflected in the goods vs services split, the difference there is less obvious, with (all) goods prices rising 0.5% QoQ and (all) services prices rising 0.5% too. With the AUD largely flat over 4Q18 relative to 3Q18, we don't think this is a currency effect, but it could well reflect the price of crude oil, which fell from the end of September to the end of December, though it is now on the rise again. With wages growth likely to support service price growth in the coming months and quarters, and oil prices no longer falling, we can see a case for Australian inflation nosing back up towards 2.0%, though this may have to wait until 2Q19, where very favourable base effects could lift the inflation rate by 0.3-0.4pp in a single quarter, taking it back above 2.0%.